Look no further than apples for a delicious dessert. They have a lovely flavor that goes well with many spices. This variation on bananas foster switches it up with apples and cardamom in place of the bananas and cinnamon. If you have long hair, tie it back before you flambé, and be sure to secure any shirt tails or sleeves. It makes four servings. In a cast-iron skillet, heat the butter on medium high until it bubbles. Add the apples and cook, stirring occasionally, until the apples are soft, about five minutes. Add the brown sugar and cardamom. Cook, stirring constantly, until the sugar and butter mixture boils. Add the dark rum. Tilt the pan to ignite or light it with a long match or lighter. Allow the alcohol to completely burn off. Stir in the heavy cream. Bring to a simmer, stirring, and remove from the heat. Serve spooned over the ice cream. 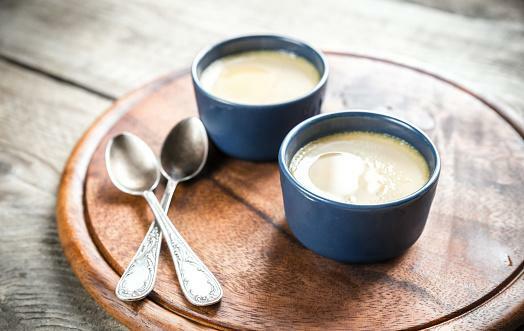 Creamy custard and sweet-tart apples are a classic pairing. Choose an apple like a Braeburn or Pink Lady, which has a nice sweet and tart flavor. This makes six servings. Lightly grease six 6-ounce ramekins. Line the bottom of each ramekin with apple slices. In a heat-proof glass measuring cup, whisk together the sugar, egg yolks, and whole egg until well combined. In a small sauce pan, bring the heavy cream to a simmer over medium-high heat, stirring frequently. Reduce the heat to medium. When the cream simmers, pour about 1/2 cup of it into the egg mixture in a thin stream, whisking constantly to temper the eggs. Then, pour that mixture back into the simmering cream in a thin stream, whisking constantly. Cook, stirring, until the mixture starts to thicken and coats the back of a spoon, three to four minutes. Remove from the heat and whisk in the vanilla and the salt. Pour into the prepared ramekins. Grate a little nutmeg over the top of each of the ramekins and put them in a 9x13 inch baking pan. Carefully pour boiling water into the baking pan, making sure you don't splash it into the custards, and put it into the preheated oven. Bake in the preheated oven until the custards set in the middle, 25 to 35 minutes. Cool on a wire rack, and refrigerate for at least two hours before serving. 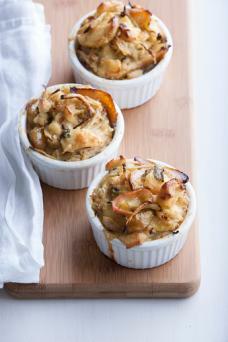 Apples are comfort food, and so is bread pudding. It's natural to put them together in this delicious dessert. The recipe serves eight. Preheat your oven to 350 degrees Fahrenheit. Grease a 9x11 inch baking dish. In a large bowl, combine the bread, apples, and raisins. In a large skillet, melt the butter on medium-high until it bubbles. Add the brown sugar and cook until it simmers. Stir in the half and half and Chinese 5 spice powder. Bring to a simmer. Whisk together the egg yolks, egg, vanilla, and salt. Add about 1/2 cup of the hot half and half mixture in a thin stream, whisking constantly. Then pour that mixture back into the half and half mixture on the stove in a thin stream, whisking constantly until blended. Remove from the heat. Pour the egg mixture over the bread and apples. Stir to combine. Pour into the prepared baking sheet in an even layer. Bake in the preheated oven until the apples are soft and the center sets, 40 to 45 minutes. Cool on a wire rack. Serve warm with ice cream or wipped cream. Apples are a versatile ingredient that you can use in many recipes. 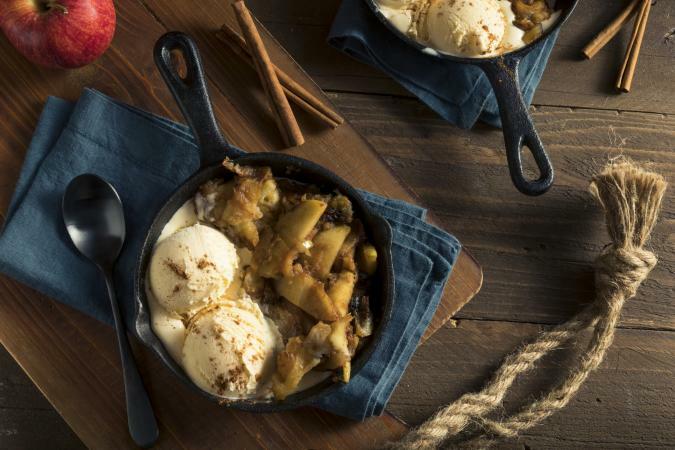 Apple crisp is a perennial fall favorite. Gluten-free apple crisp is perfect for people with celiac disease or non-celiac gluten sensitivity. Spread a little apple butter on a muffin for the perfect bite. A basic apple pie is a classic dessert. However, for variety, try alternative apple pie recipes. Not a traditionalist? Try French apple pie. Have green apples? Make a green apple pie. Try a simple apple pie with fairy apple pie. Looking for something cooling and refreshing? Try this apple sherbet. Apple fritters are toasty and delicious. Apple dumplings are little bites of goodness. Baked apples are simple, and they make the apple the star. An apple tart uses short crust as the pastry. Apples and puff pastry are a tasty combo. A Mediterranean style baked apple is perfect for people following a Mediterranean diet. Apples have a sweet, tart flavor that makes them perfect for desserts. Try them in the fall during the apple harvest for the most delicious results.